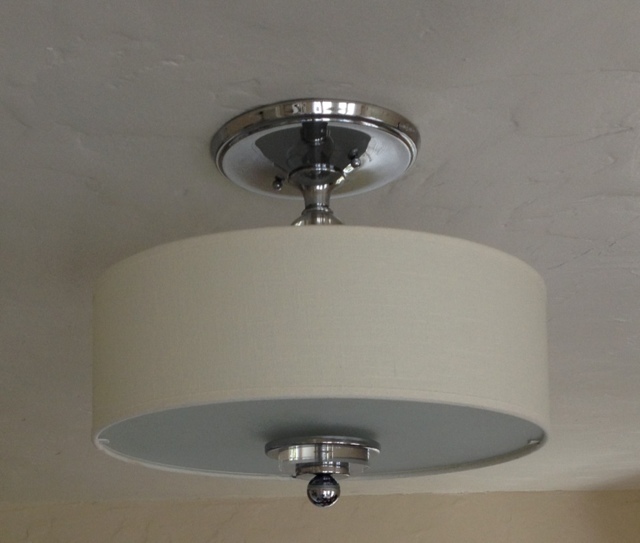 Have you seen these fabulous pendant light drum shades at Room and Board? I’ve been drooling over them for years, with all the gorgeous prints and colors. They’re a splurge at several hundred dollars a shade, but they are really beautiful. Go check out all the beautiful and funky prints they have! 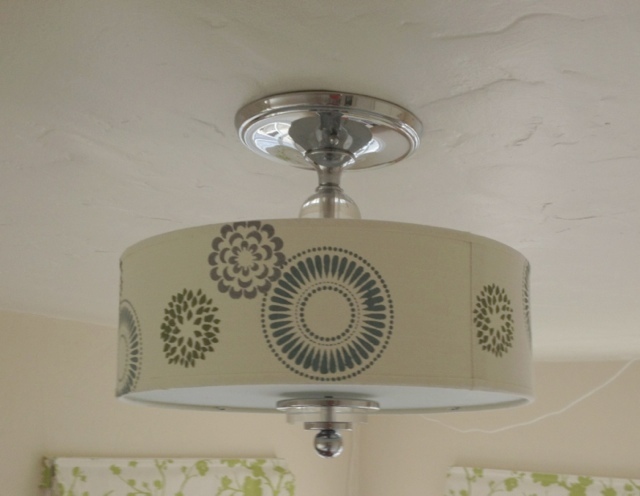 Galbraith & Paul drum shade from Room and Board in Zinnia Cool pattern. As always, I was wondering if I could make something like this myself, and in browsing ideas, I found some great examples, including this one from Laura at Some Kind of Lovely Ride. 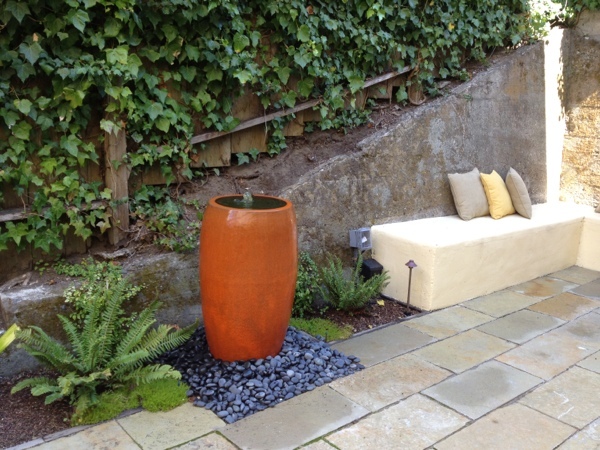 She did a beautiful job on her shade and had great instructions that helped me conquer my apprehension about this project! 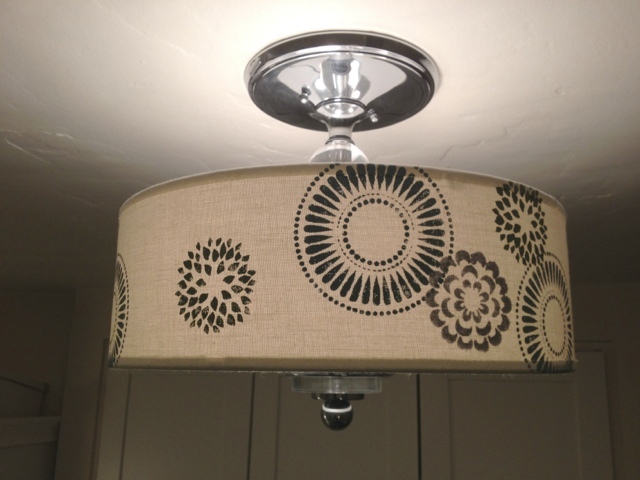 Yellow floral stencils on a lampshade by Laura at Some Kind of Lovely Ride. 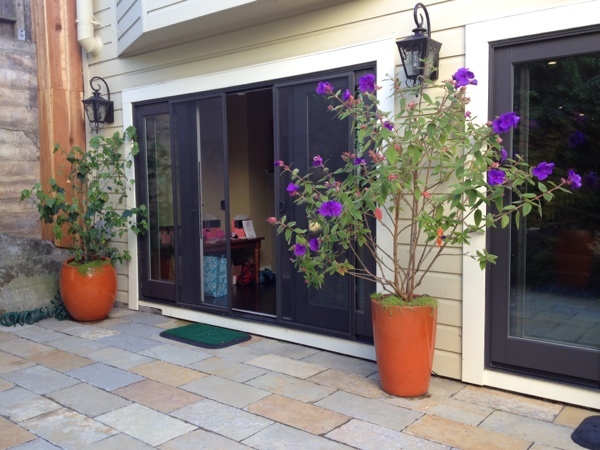 A perfect DIY inpsiration! 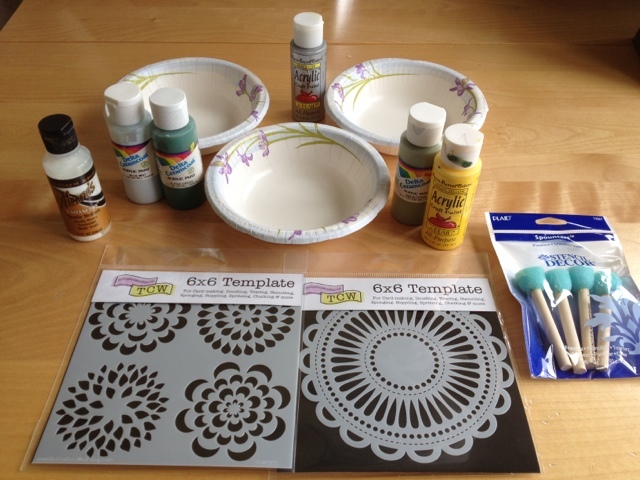 Supplies for stenciling on fabric. 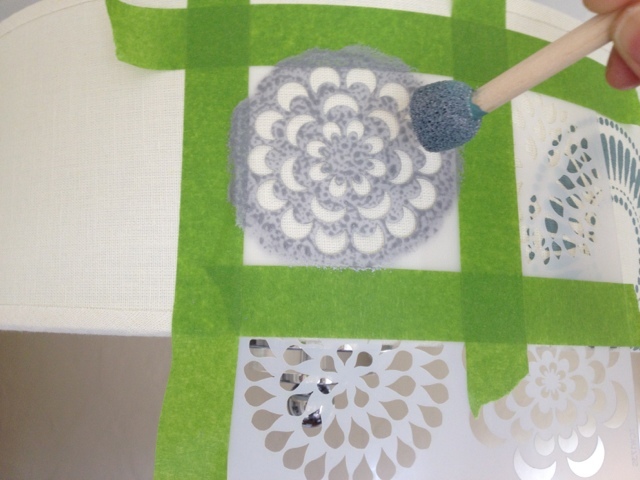 Stencils – I used Mini Peony and Mini Mums by The Crafter’s Workshop. Stencil brushes or sponges – These sponge “pouncers” are inexpensive, easy to use, and washable for reuse. Paint – I had a variety of acrylic craft paint around, and I did mix some to get the colors I wanted. It’s optional, but I also added some “textile medium” to my paint, which makes the paint more flexible when dried. This wouldn’t be an issue for the shade, but I thought it would help on the pillow. I mixed the paints in paper bowls. Tape – I used painter’s tape to hold the stencil in place and mask off any areas of the stencil I didn’t want to use. Put a small amount of paint on your pouncer. If you load on too much paint, it will run under the stencil and smudge your pattern. Lightly dab through the stencil, moving only up and down. Don’t brush side to side, as this will also make paint run under the stencil. Tape your stencil in place and lightly dab on the paint. Wait until the first color is completely dry. If you are going to overlap designs, like I did, think ahead about which color you want to be “on top” and start with the colors that are on the bottom. This is not necessary for a shade, but for a pillow or other fabric that will be touched and possibly washed, you’ll want to set the paint. When the paint is thoroughly dry, iron the stenciled fabric from the reverse side with a dry iron on medium-high for three to five minutes to set the colors. You can repeat this on the front, laying a thin cloth over the stenciled fabric, so the paint doesn’t stick to your iron. A simple drum shade. Pretty, but I wanted to add some color! 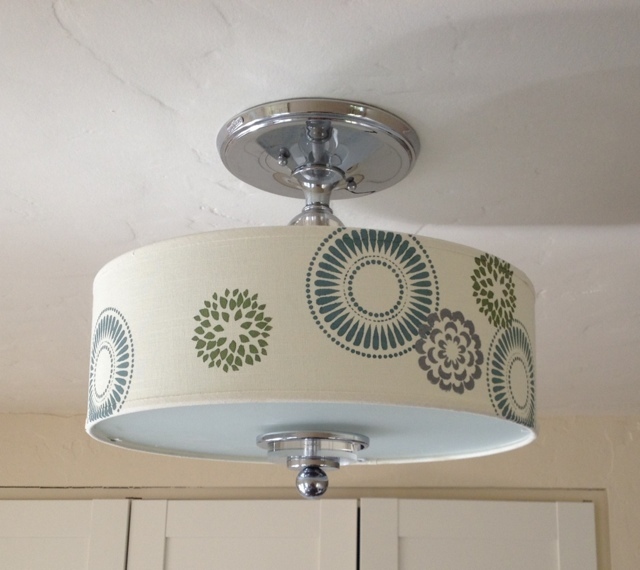 Drum shade transformed with floral stencils in blue, green, and silver. I dare say, I like this better than the inspiration shade! 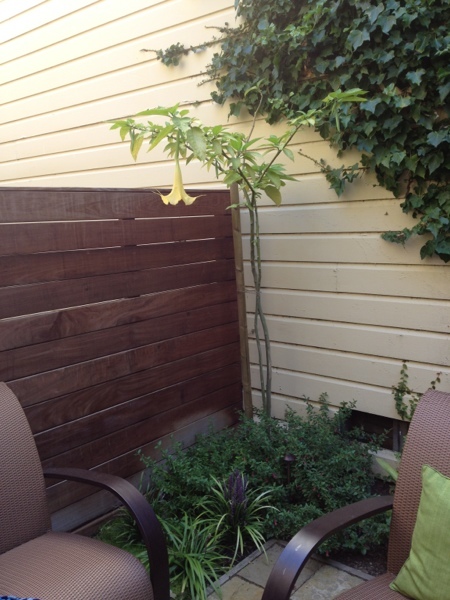 The random pattern of stencils gives a different look from every side. And it makes it easier, because you don’t have to worry about lining up the pattern. Lit up at night. No, I’m not tired of looking at it. Can you tell? Here’s the finished fabric. I’ve got a lot of pillow projects lined up, so I should work on those soon! 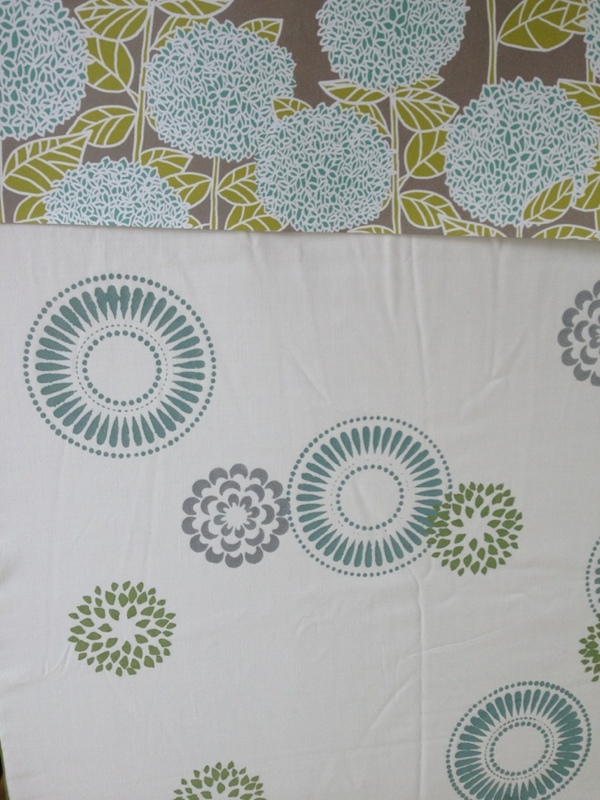 The stenciled fabric, on the bottom, will be a throw pillow for the daybed. The colors coordinate with the hydrangea print paper I found. I’m making desk accessories and some other projects with the paper. 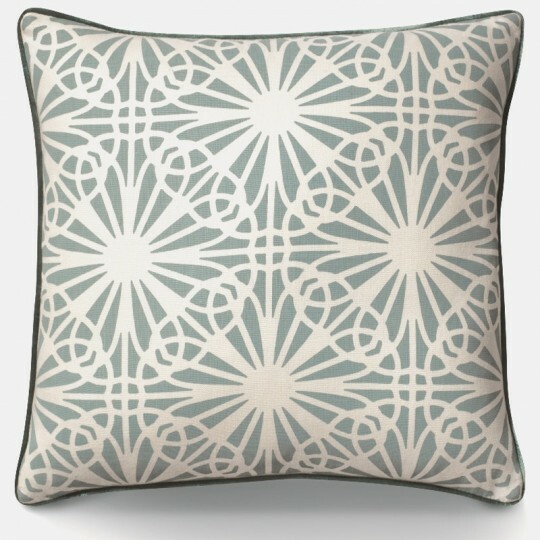 I’m making some throw or accent pillows for our home. 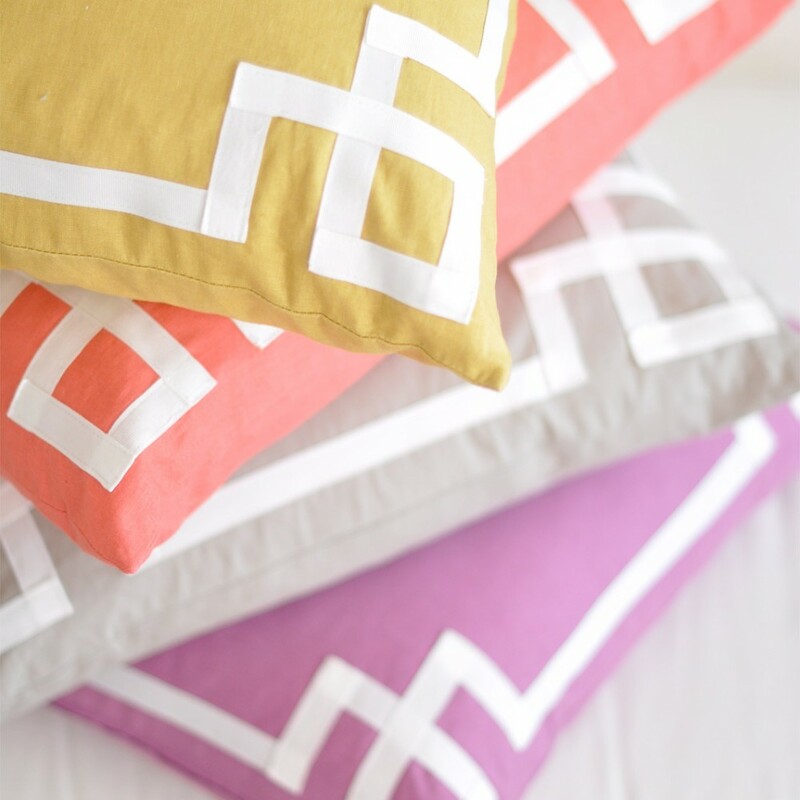 Sewing straight lines is a doable project for me, and I like to make pillows using some of the same fabrics that are in other parts of a room (such as the upholstered chairs in our dining room and my craft room), to tie the space together. By Caitlin Wilson Textiles. Click the picture for details. 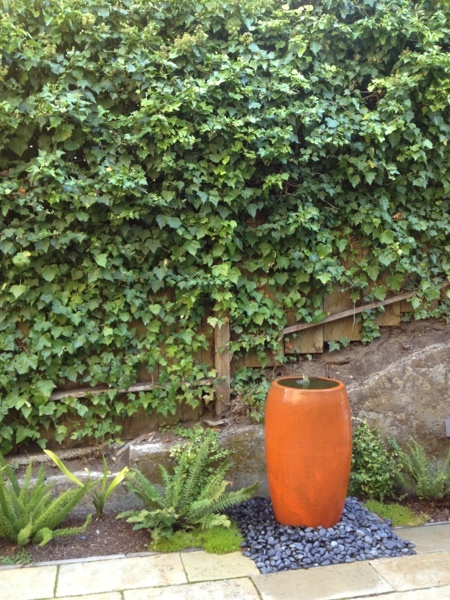 I like this pattern shown at Better Homes and Gardens. They used fusible web to attach the ribbon. 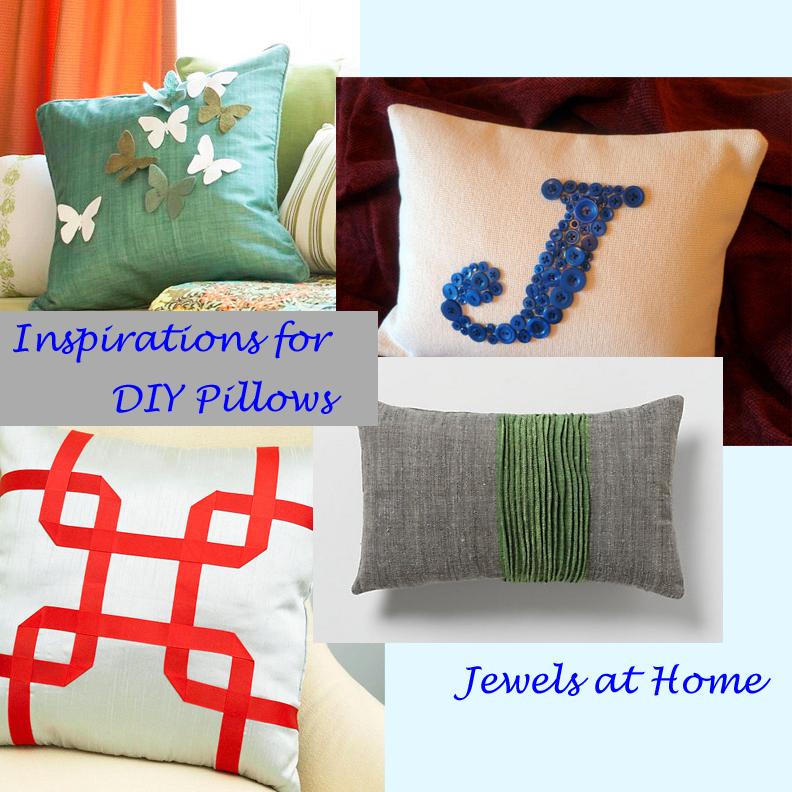 Click the picture for more pillow ideas on their website. 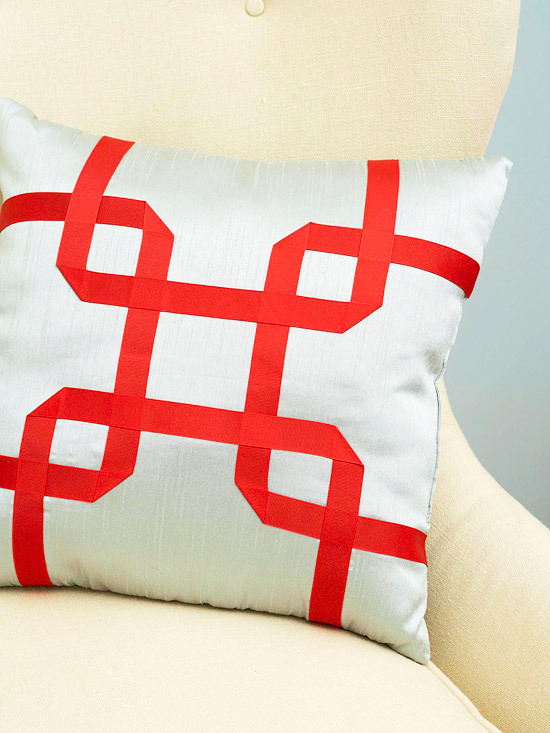 These ribbon details on simple pillows gives a classic and elegant feel. You could also do a simple square. I love the look of a different color on the front and back. 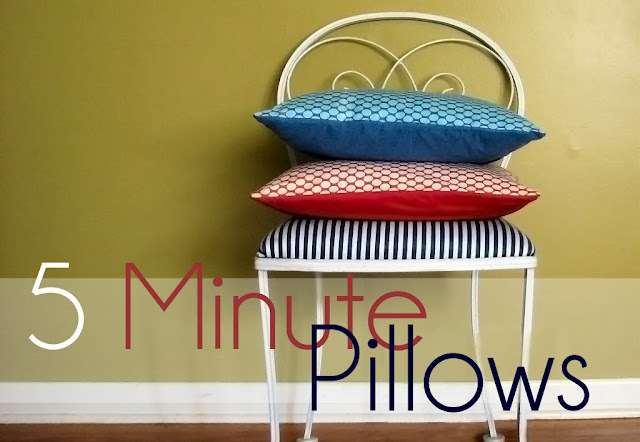 This picture is from Grosgrain, where Kathleen has some tips on making a quick pillow cover. Add a letter or other pattern with buttons. This is a beautiful example by Peggy at Letter Perfect Designs on Etsy. (And I’m not just saying that, because it’s a “J”!) Click the picture to see more beautiful button art! These three dimensional felt butterflies are so sweet! Click the picture to see the tutorial from Better Homes and Gardens. 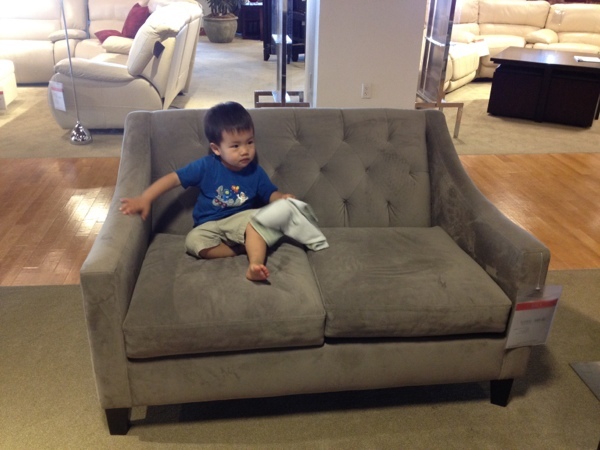 This pillow is made by Weego Home. Click on the picture to see their stunning collection. A stunning print like this would be beautiful on its own, but I love the piping detail. Here’s a tutorial on eHow for applying store-bought welting or piping. I’d love to learn how to do that! 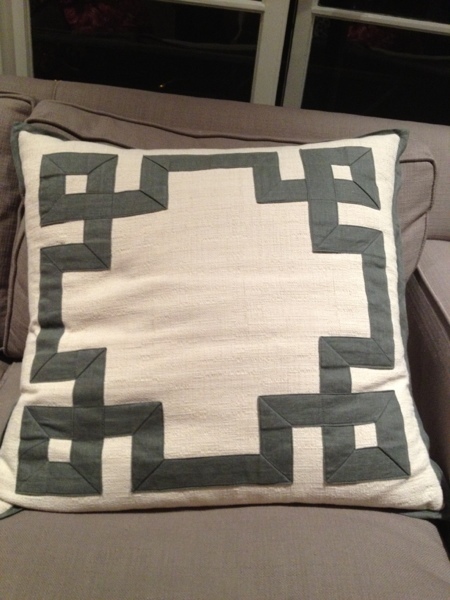 This incredible pillow by Weego Home is cut velvet appliqued on linen. I think you could get a similar look with painting on fabric, though obviously, it won’t have the rich feel of this original. Click to see their collection. 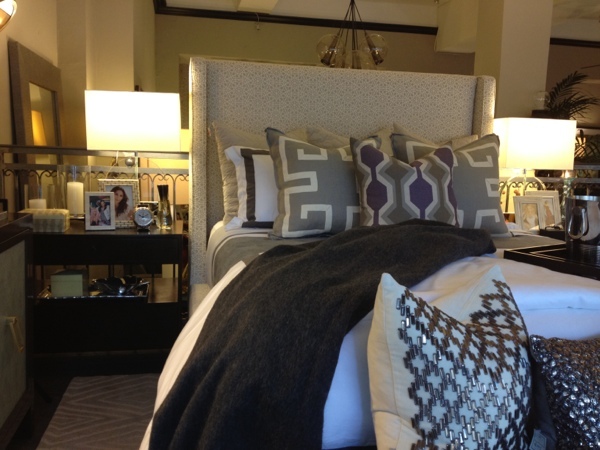 I like the use of panels made from two fabrics, especially the way it is asymmetrical. 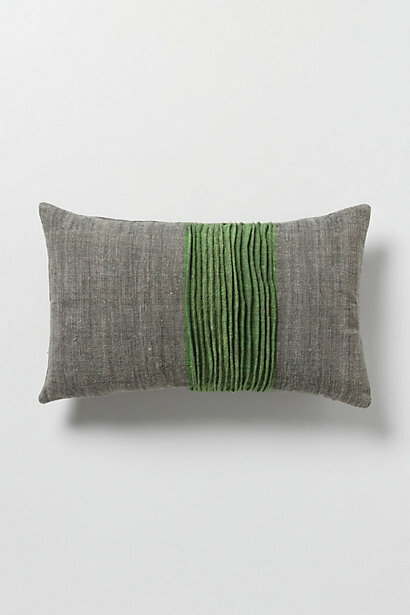 This pillow is from Anthropologie, though it is no longer sold. 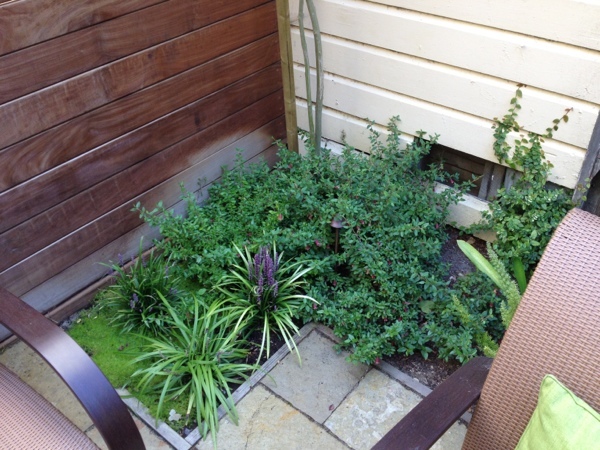 These are some of my favorite ideas – what are some of yours? Hope to post my new pillows soon! P.S. Don’t forget that there’s a May Giveaway. Comment on any post by May 15, and I’ll select a winner to receive a custom wall initial.